Insulin Delivery Devices Market size was valued over USD 12 billion in 2017 and is expected to witness more than 6.5% CAGR from 2018 to 2024. Increasing demand for insulin delivering devices and minimally invasive alternatives such as pumps, advancements in insulin devices in terms of design and functioning, increasing prevalence of diabetes and ease offered by some insulin delivery devices to patients are some of the major market growth driving factors observed worldwide. Globally, escalating prevalence of diabetes is the prominent reason behind insulin delivery devices market expansion. Owing to inappropriate eating habits and lack of physical work; diabetes incidences are rising at alarming rates in developing countries too. From the consumer’s side, usage complication and probability of injury due to injections have been resulting in shift from invasive devices to minimally invasive ones. More and more minimally invasive devices are gaining demand around the globe, especially in developed nations. The insulin delivery devices market faces some peculiar challenges which have been and will continue to be hindering growth during the forecast period. 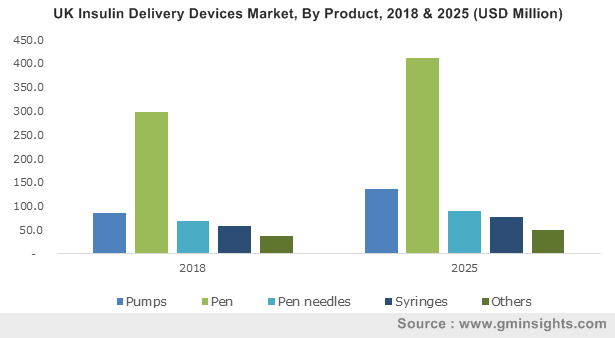 Factors such as high cost of insulin and insulin delivery devices, inconsistencies in adherence of insulin uptake and psychological resistances to self-injection due to needle-phobia are major roadblock in insulin delivery devices market growth. Low per capita diabetes expenditure, and lack of reimbursement and insurance coverage in emerging economies happen to be significant constraints in industry growth. During the forecast period, high cost of devices will result in slow and low adoption rates, especially in resource poor economies. Insulin pumps market was valued more than USD 1.9 billion in 2017 and is forecast to grow at a CAGR of over 7.5% from 2018 to 2024. The need for better diabetes management will drive demand for the insulin pumps during the forecast period. Minimally invasive nature of pumps will increasingly attract more consumers over the coming years, especially in industrialized nation; however, their cost will prove to be a major restraining factor for the business growth. Insulin pen is most popular in insulin delivery devices gamut; in fact, its market valued at over USD 6.5 billion in 2017. Being available since late 1980’s, its business has grown into a multi-billion-dollar market and is expected to lead the industry during the forecast period. Insulin pen adoption is most likely to grow in developing nations having more than average diabetes patient in low income group. U.S. insulin delivery devices market was valued at USD 5.0 billion in 2017 and accounted for regional share of more than 95% in 2017. Increasing diabetes prevalence coupled with rising disposable income level will drive market growth over the forecast period. Technological advances in insulin delivery devices along with favourable government initiatives to execute better diabetes management will further fuel industry growth. Germany insulin delivery devices market held around 30% of the regional revenue share in 2017. Expanding elderly population base, rising incidence of diabetes, favourable reimbursement policies and increasing disposable incomes will serve as high impact rendering factors. China insulin delivery devices market was valued at USD 1.1 billion in 2017 and it anticipated to witness around 14% growth over the forecast period. With its huge diabetic population and rapid economic development, the country spends almost USD 25 billion for treating diabetes related diseases annually. However, only about 35% of diabetic population is aware of being diabetic and are receiving treatment for their condition, whereas rest are undiagnosed. Improvement in diagnosis rate and increased awareness towards early diagnosis will drive demand for insulin delivery devices over the forecast period. 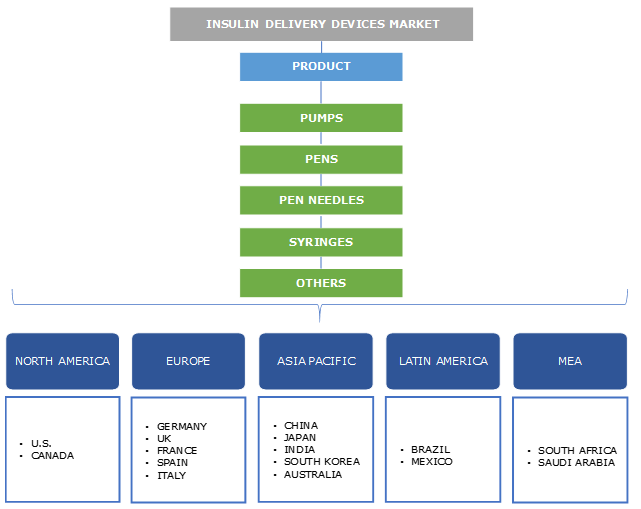 Some of the major players of global insulin delivery devices market are Eli Lilly, Sanofi, Novo Nordisk, Beckton and Dickenson, Roche, Medtronic, Insulet Corporation and Ypsomed. Industry players are focusing on new product development to offer superior insulin delivery devices. Geographic expansion is one the major strategies adopted by big companies to gain market share. Insulin delivery devices industry has been rapidly developing since its inception in late 1970’s; when first insulin pump was manufactured. Post launch of first device, the industry has been through a rapid evolution in terms of increasing number of companies developing new products such as reusable pens, safely needles, etc. Although being in the growth phase, the industry is still witnessing introduction of novel products such as tubeless insulin pumps. Currently, only handful of companies offer tubeless insulin pumps, and many are in process to launch their version of pumps in market in near future.